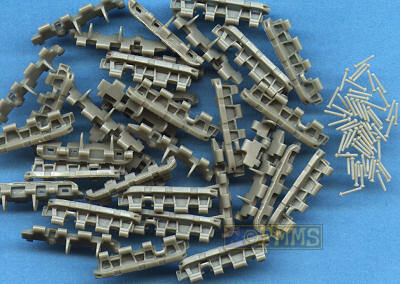 Continuing the resin individual tracks sets from Russian company MasterClub in their pin together series is this set of early Tiger I tracks without the ice cleats and again are fully workable after assembly. 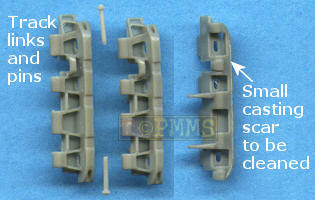 There are 220 handed (mirrored) track links and 440 small track pins in the set with the links cleanly cast in light grey resin and the only clean-up required is the remnants of the casting blocks on one end of each link which is quickly removed with a #11 blade. The links are packed into two separate unmarked zip lock plastic bags not identified left or right but this is very easy to work out with Tiger I tracks unlike some other handed tracks where the difference is minimal. Detail on the links is very crisp and cleanly cast with the hole on the guide teeth included and there is very little additional cleanup required other than the odd bit of flash in the guide tooth recess. The small tapered pins have nice track pin detail on the ends which adds to the detail effect after assemble. Assembly uses the pin together system where the links are held together with the two small tapered pins but you have to drill out all the pin locating holes in the links (four on each link) using a .6mm drill bit as they are not fully opened out and this does take a little time to prepare the track links for final assembly. After drilling out the location holes and trimming the small casting scars assembly goes ahead fairly quickly as the track links and pins fit very neatly and easily together. I found it easier to fit the outer pin first as this made inserting the inner pin inside the larger boss a lot easier and using the end of a pair of tweezers or blunt side of a knife blade to press the pin home will see the links hold together without the need for any glue making assembly even easier. Just make sure you don’t force the pins into the link holes as they will break easily but lining up the holes in each link is quite easy and this shouldn’t be a problem with a little care taken. After assembly the track runs were fairly tight but still articulated nicely with the pins make for a very robust track run that will not come apart under normal conditions. The track runs fit nicely to available Tiger I kit sprockets and I test fitted these to the Dragon Tiger I Early Production kit sprockets here without problems. The detail on these links is very good and while there is a bit of preparation required with drilling out the locating holes the fit of the links is excellent and fitting the small pins in place is quite easy once you get into a rhythm. These tracks add to the ever growing list of aftermarket Tiger I tracks and offer excellent detail with a very robust and easy pin assembly system despite the extra work drilling the pin holes which is offset a little by the minimal little cleanup required.